? ?August 9-11 Milford, MI ?? Most items are shipped within the week. If you need it sooner please convo and I will let you know if it can be done. Good experience. Great art piece. 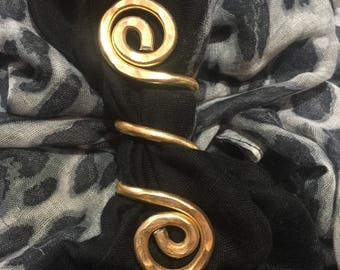 I had purchased some vibrant silk scarves that I needed to keep secured without a pin (hole), these coils hold scarf in place without damaging or even wrinkling my scarf. Now add to that - the colors that are offered are unbelievable. 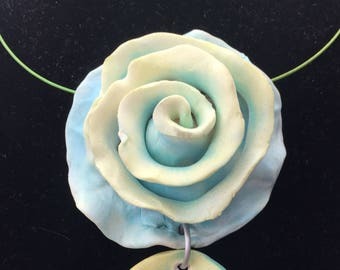 I will be ordering more as gifts for birthdays and the holidays. There are various sizes of coils to manage any thickness of scarf. I take pride in creating quality pieces of art work. Please check your order as soon as you receive it to make sure everything arrived okay. If you are ever dissatisfied with something please let me know immediately so that I may address the issue. I truly want you to be happy with your purchase and want you to return for years to come. I've done art shows for over 20 years now and have a loyal following. Since my artwork is my families only source of income I do take your business very serious. Any refunds must be requested when item is received. I must here from you when you receive it so any issues may be resolved. At that time you may refund or exchange. After that time I will exchange only. My payment of choice is pay pal. I do not accept checks simply because of all the traveling I do. I am not home to receive the checks, but do ship from the road. All orders are shipped on Monday or Tuesday of each week. I must receive order by Saturday evening to ship that week. Orders placed after sunday will not be shipped until the following week. If at all possible I will ship sooner if it is something I can recreate. Otherwise the item is pulled from my art show that weekend and shipped. On Monday or Tuesday. Convo first if it is something you need right away. Wholesales are welcome. Please convo for discount.